ONCE a month Hetech staff come together to celebrate staff birthdays, with coffee and cake, lots of laughter and singing. Today however, was a little different. Today we celebrated an important milestone in one of our staff members’ career. 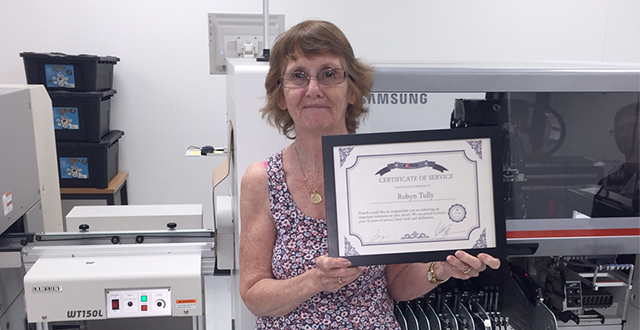 Robyn Tully, electronics assembler and store coordinator, was honoured today for her 15 years of service, hard work and dedication to Hetech. Robyn joined the Hetech family in 2000, and we have cherished her diligence, work ethic, positive attitude and happy face for the past 15 years. The team at Hetech woud like to congratulate Robyn on achieving this important milestone; we are proud to have you as part of the team!